Put the orange peel in the oven and turn it to 150°C/gas mark 2. Bake until dry and fragrant - about 30 minutes. Meanwhile, put the Szechuan peppercorns in a small dry frying pan over a medium heat. As soon as they smell fragrant, remove and put in a spice grinder or pestle and mortar. Add the dried orange peel. Grind both into a powder and put in a mixing bowl with the cornflour and salt. Cut the beef into long thin matchsticks. Add to the cornflour and mix thoroughly. Leave to marinate for 20 minutes, then, using your hands, mix in 2 teaspoons of sunflower oil until all the beef strands are separate. Cut the carrot into fine sticks - roughly the same size as the beef. Heat the oil in a deep fat fryer or deep saucepan to 200°C. Carefully add some of the beef - the fat will froth up - and cook for 30 seconds until firm. Remove and drain on kitchen paper. Once the oil returns to 200°C, repeat the process until all the beef is cooked. Lower the temperature to 190°C, and add the carrots in a few batches. Deep fry for 2 minutes or until they are golden with a slightly dry, almost crisp texture. Remove and drain on kitchen paper. Mix together the sugar, vinegar and soy sauce and set aside. When you are ready to serve, heat 2 tablespoons of oil in a non-stick frying pan or wok. Add the ginger, stir fry for a few seconds then add the garlic, chilli flakes and sliced red pepper. Cook for 30 seconds then add the sugar, vinegar and soy sauce. As soon as it is hot, stir in the beef, deep-fried carrots and spring onions. 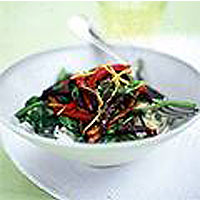 Heat through and serve immediately with steamed rice and stir-fried greens.